100% recycled paperboard is a high-quality product used in packaging and other consumer and industrial products that have been made from recovered paper collected for recycling. 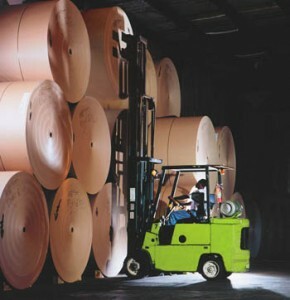 In our mills making 100% recycled paperboard, no trees are used. Instead, we make our pulp by mixing paper with water. Like an extremely large blender, rotating fins in the pulper reduce the paper to individual fibers, producing a paper slurry. The pulp is then washed and refined. At this stage, contaminants like small pieces of glass, staples, plastic, and any other non-fiber materials that were mixed in with paper are removed . The clean paper slurry is then moved through the paper machine on a series of screens. As the pulp travels, water is drained away from the slurry. The remaining paper fibers are pressed with rollers and dried to form large sheets of paper. Because our products are used by some of the most demanding companies in the world, every effort is made to assure the highest quality. Computerized sensors and state-of-the-art control equipment monitor each stage of the process to ensure that the paper meets or exceeds all standards, including the thickness and smoothness requirements of the consumer. As the paper exits the machine, it is either stacked in large sheets or wound into large rolls. The 100% recycled paperboard is sent to a printing plant or a converting facility where it is transformed into a box, core or tube, fiber can, folding carton, overnight envelope, or other consumer or industrial product.